Custom Stone Works - Atlanta Stone Works Inc.
Atlanta Stone Works is a manufacturer of custom countertops, vanity tops, fireplace surrounds, conference tables, and basically anything that can be made out of slab material. They most commonly manufacture granite, marble, limestone, onyx, quartzite, soapstone, slate, and man made quartz i.e. caesarstone, silestone, cambria, and many more. The options are endless for what can be done with slab material. Besides fabricating, Atlanta Stone Works Inc. also installs all of their own products and offers a variety of options for edging and sinks. They are a turn key countertop fabrication and installation company that services the residential and commercial markets through builders, remodelers, general contractors, and directly through the homeowner. 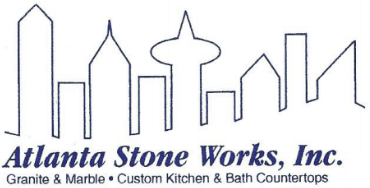 Atlanta stone works inc. was founded in 1999 by Steven L. Sheffield Sr. It is now a family business owned and operated by Steve and his son Brett Sheffield. Steve is a father of two and has been married for 35 years. He has been in the countertop industry since 1985, and is still hands on with the business today. Brett is the father of four and has been married for 12 years. He has a degree in Management from Kennesaw State University and has worked in every aspect of the business before becoming a co-owner in 2012. He manages the day to day operations of the business. If you buy countertops at Atlanta Stone Works one of the two will definitely be part of the experience. The business started out in a leased warehouse space and has grown to a 12,000 sq ft facility. In the beginning, our business fabricated and installed 5 kitchens a week. Today Atlanta Stone Works Inc fabricates and installs 15-25 jobs per week in Georgia, Alabama, South Carolina, North Carolina, Tennessee, and Florida. nnThe shop works very hard on maintaining the personal experience that made the business what it is today. Atlanta Stone Works is your local company with the capabilities of the largest fabricators in the world. The Fabrication facility is equipped with two large cnc routers and a twin table cnc bridgesaw and waterjet. The cnc machines are American made machines that are of the highest standards in the industry. These machines enable Atlanta Stone Works Inc. to produce the most detailed and fine countertops in the industry very rapidly. The water jet can cut out any desired shape, no matter how ornate. (www.northwoodmachine.com) Our staff is trained in advanced programming, the possibilities are endless. There is a 1200 square foot showroom on site, as well as a 3000 square foot indoor slab storage area for customers to view the exact slabs that will be used for their project, and a full selection of sinks for their project. Visit them today at 2033 Baker Ct., Kennesaw, Ga 30144 and get your countertop project underway. AT ATLANTA STONE WORKS INC. OUR INTEGRITY IS BUILT ON SOLID ROCK! !